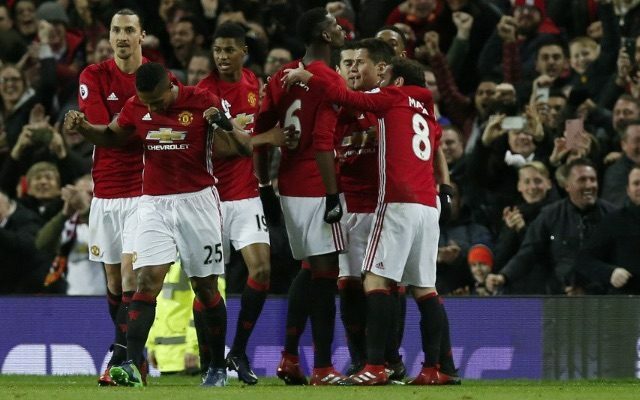 Manchester United hit two late goals as they came from behind to earn a 2-1 win over Middlesbrough at Old Trafford on New Year’s Eve. United bossed the game – firing in 32 shots to Boro’s nine – but they looked like they might suffer a shock defeat until man-of-the-match Anthony Martial cancelled out Grant Leadbitter’s 67th-minute opener on 85. Paul Pogba followed that equaliser almost immediately with his seventh goal for United, which gave the Red Devils their fifth consecutive victory in the Premier League. Considering United have one of the stingiest defences in England, the game was surprisingly open early on. Boro had a great chance to take a shock lead when they broke three against one, but Antonio Valencia did well to make Adama Traore hesitate, before the former Barcelona winger punted a poor shot wide, despite having better options left and right. At the other end, Martial frequently terrorised Boro right-back Calum Chambers. One Martial cross in the opening 15 minutes eventually fell for Pogba, who hit the post with an overhead kick. Boro crafted another glorious opportunity moments later as Traore burned Daley Blind down the United left, before pulling the ball back to George Friend, who had an open goal to aim a first-time shot at, but instead chose to take a touch, which allowed Marouane Fellaini to make a block. United soon took control and were thoroughly dominant for the rest of the first half, with Martial again their chief creator. Martial set up Henrikh Mkhitaryan to force a decent save out of Boro goalkeeper Victor Valdes, before the Frenchman sent in an inviting cross for Fellaini to head onto the roof of the net. Mkhitaryan and Fellaini each went close again before the interval, with the Armenian fizzing a low shot just wide, after the big Belgian had seen his shot blocked by the impressive Ben Gibson. United hit the post again, with Martial rattling the woodwork from long range, before Zlatan Ibrahimovic – who had been largely anonymous until this point – had a goal controversially disallowed. Ibrahimovic displayed impressive agility to get his foot high enough to prod home from a Martial cross, but referee Lee Mason deemed this to be dangerous play, much to the disgust of United manager Jose Mourinho. Valdes and Ibrahimovic went toe-to-toe again at the start of the second half, with the keeper making a smart save with his feet. Then Pogba, who bossed the midfield with some superb tackling and an excellent variety of passes, got into the penalty area to attempt another acrobatic shot. This one skewed wide. Unlike in the first half, Boro showed very little attacking ambition in the early stages of the second. However, shortly after United made a double sub – bringing on Marcos Rojo and Juan Mata for Blind and Fellaini – Boro committed to an excellent offensive move, which gave them the lead very much against the run of play. Leadbitter only touched the ball 28 times all afternoon, but he looked far from rusty as he prodded cooly past David de Gea following Alvaro Negredo’s tidy assist. Mourinho responded to seeing his side fall behind by throwing on striker Marcus Rashford for Chris Smalling. Rashford frightened the Boro backline with his pace, firing a low cross across the face of goal with no reward, before having a decent penalty shout turned down when hitting the deck under a challenge from Bernardo Espinosa. United continued to bombard Boro with attack after attack as the game drew closer to its conclusion, but they found Valdes in sublime form. The Spanish stopper, who made just two Prem appearances during his frustrating United career, was at his best to thwart Ibrahimovic, Rashford and Martial. As United grew frustrated, they went route one. And it brought them the equaliser they richly deserved. Ibrahimovic’s knock-down found Martial, who finished clinically with five minutes left to play. Less than two minutes later, United were ahead as Pogba headed home from a super Mata cross. United’s fifth straight win sees them end 2016 just one point behind the Premier League’s top four, while Boro going into the New Year in 16th place. De Gea 6; Valencia 7, Smalling 5, Bailly 6, Blind 6; Fellaini 7, Herrera 6, Pogba 9; Martial 10, Ibrahimovic 7, Mkhitaryan 7. Valdes 9; Chambers 6, Bernardo 7, Gibson 8, Friend 7; Traore 7, Leadbitter 7, Forshaw 6, De Roon 6, Downing 6; Negredo 6. Ramirez 5 (on for Downing on 63 mins), Clayton 5 (on for Leadbitter on 67 mins), Fabio 5 (on for Traore on 82 mins).